At least 32 people have died in two separate blazes at factories in Pakistan. 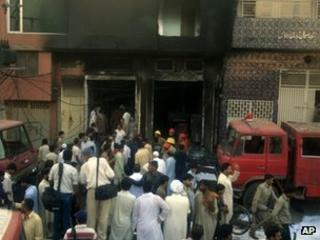 A fire at a shoe factory in Lahore, attributed to a faulty electricity generator, killed 23 people. Later at least nine died in a blaze at a garment factory in Pakistan's largest city, Karachi. The cause of the fire is not yet known. Pakistani Prime Minister Raja Pervez Ashraf expressed his shock and grief after news of the first fire emerged. In Lahore, medical officials said some people had died of suffocation while others were burned alive as the fire took hold. According to a senior police officer quoted by the Associated Press, six people were also injured in the blaze. He told the news agency that the fire broke out as people in the building tried to start their generator after the electricity went out, igniting chemicals in the factory. One of the workers who managed to escape said that all the chemicals and the generator were in the garage, which was also the only way out of the building. Muhammad Shabbir, whose cousin was so severely burned he later died in hospital, told AP there was no way out once the blaze started. One local resident, Bilal Ahmed, was among those who went to help rescue people from the blaze. "We broke through the outer wall," he said. "People were lying unconscious. At first, rescue workers took out a couple of people. Then four, five of us went inside slowly and we pulled out many people." Many people in Lahore have set up shoe factories in their residences, few of which follow building and safety regulations, often lacking fire exits and fire extinguishers. In Karachi, police said at least nine were killed and at least 20 were injured in the blaze at the garment factory. A police official, Sayed Mohammad Yousuf, told AFP news agency that several workers were still trapped inside the burning building. "Two women were among the dead. I fear the death toll may rise," he said.